Conceivably there's a 13-year-old boy somewhere for whom the words "post-apocalyptic thriller" have a ring of startling novelty. Perhaps living in remote Lapland, or under a bridge in Baltimore, this culturally deprived lad may well find "The Colony" a marvel of jaw-dropping innovation and heart-pumping excitement. For the rest of the movie-going world, who have endured innumerable trips to the other side of civilization's demise by now, the film is more likely to taste like a dish reheated far too often. Kind of a mash-up of standard-issue dystopian sci-fi and basic zombie-movie tropes, the film can claim a couple of solid performances by veteran actors and is well-executed at a technical level. Its innumerable wide-angle shots of terrified people (or their ghoulish pursuers) dashing pell-mell down dark underground corridors are nicely photographed, no question about it. 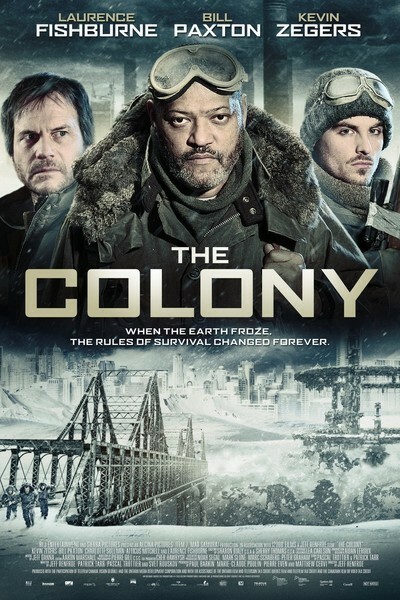 The problem is that the filmmakers' aversion to any hint of storytelling originality means that the main impression "The Colony" leaves is one of almost stupefying over-familiarity. As in most films of its ilk, it doesn't much matter what made Earth's civilization collapse like a botched soufflé. It's gone, that's all. It's the year 2045, the planet's surface is an icy waste and the only folks left alive are cowering and shivering in underground colonies. In Colony 7, a draconian regime is in force. Since some sicknesses can kill, anyone who gets ill is placed in quarantine. If they don't get well, they're given a choice: get shot or take a long last hike into the colony's Siberia-like surroundings. But even that harsh order is breaking down thanks to the paranoia and snarling wrath of the colony's sergeant-at-arms, Mason (Bill Paxton), who's begun to decide on his own when executions are in order. The film opens with him gunning down a choice-deprived sufferer like one of nastier Nazis in "Schindler's List." The main purpose of this character, obviously, is to give the film a cheap source of bloody mayhem from the get-go. Never mind that his presence makes the story's main action even more implausible than it would be without him. Notwithstanding Mason's psychotic predations, Colony 7 is nominally ruled over by Briggs (Laurence Fishburne), a wise and stout-hearted commander of the sort seen in every war movie since the dawn of time. One day, a distress signal comes in from Colony 5, which seems to be in trouble but is not going to a lot of pains to say how. Briggs thinks about it and decides a rescue mission must be mounted. This of course is the movie's "yeah sure" (otherwise known as eye-rolling) moment. Yeah sure, the colony's conscientious father figure would leave his terrified charges in the care of his bloodthirsty deputy and go traipsing into the snowy wastes on an almost surely suicidal mission of mercy. Right. By such logic have countless teenage virgins wandered into dark, slasher-infested rooms without bothering to turn on the light. In any case, Briggs sets out with two companions. Sam (Kevin Zegers) is the film's romantic lead. You can tell that because he's young, handsome and has a girlfriend (Charlotte Sullivan). Graydon (Atticus Mitchell), the other one, is young, cute and appears to have no girlfriend, which means he's probably a virgin, and you know what that means: he'll get snuffed as soon as the snuffing starts. And so it comes to pass. Once the three men traverse the arctic wilderness, they enter the creepily quiet Colony 5 and discover there was a very good reason for that distress signal: the colony's inhabitants are presently serving as breakfast, lunch and dinner for a small army of rampaging flesh-eaters. These are "feral" humans, we are told, not zombies. It's a fine distinction, though, since they look, walk and wreak bloody havoc exactly as zombies in movies and TV shows the world over do. You can close your eyes and picture the rest of the film's paint-by-numbers plot. Yep, Graydon is instantly offed and then the zombies, I mean feral humans, chase the other two across the snow (all the exteriors are CGI-created) all the way to Colony 7, where one of our heroes leads his fellow colonists in a heroic battle to ward off their ravening attackers and thus save the world, or at least their own skins. The only glints of distinction in this whole lackluster enterprise come in the performances of Fishburne and Paxton. Both are fine actors, and their work here is persuasive and wholly committed, betraying not a hint of embarrassment at what surrounds them. Some of the descriptions of action given here would have been preceded by "spoiler alert" but for the reviewer's conviction that nothing about this movie could possibly be spoiled for any sentient viewer—except perhaps the sheltered 13-year-old noted above, to whom sincere apologies are offered.